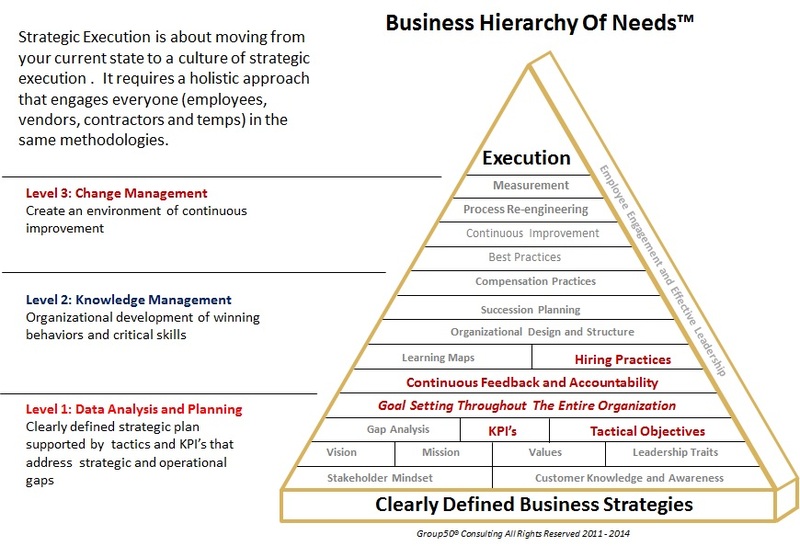 Your corporate strategy is as critical to success, as is your organization’s Strategic ExecutionTM. 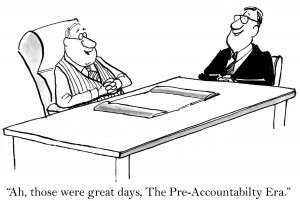 However, the level of accountability determines whether strategic gains are sustained or not. An accountable culture features extensive employee self-management enabled by related tools, key performance indicators (KPI’s) and processes. As well, such cultures enable the company’s executives to focus on where the business is going. Ensure that “accountability” is an explicit, key value of the organization and a factor in assessing and hiring candidates. Each functional area such as Sales & Marketing, Finance, etc. will have their own unique set of KPI’s. Ensure that local functional and/or regional KPIs, and corresponding employee objectives, support key, high-level business goals established by company’s strategy and strategic plans. Avoid “us/them” internal functional dynamics by ensuring that relevant performance metrics are part of the assessment process for all stakeholders (employees, temps, contract workers, suppliers, customers => everyone). For example, some service metrics can be shared by Purchasing, Manufacturing, Planning and Sales, innovation metrics by Engineering, Marketing, Sales and Manufacturing, etc. Reinforce local, balanced scorecards with regular business updates indicating overallbusiness performance and its links to local KPIs. Tie performance and behaviors which serve the business into employee reviews, bonuses, and promotion opportunities. In the hiring process, make accountability part of employee screening. Establishing an accountable culture isn’t an overnight activity. It is one of several building blocks that are needed to have sustainable excellence. We can help.We suggest starting with Group50’s Culture Assessment, which will analyze how your company’s culture impacts results and suggest related areas to address. Group50 global management Consulting Firm offers operational, organizational design and strategic execution services that can cater to your specific business; these can be found in greater detail on our website.